I get the impression that many Americans believe Medicare is financed like Social Security. They know that a portion of payroll taxes goes to Social Security and a portion goes to Medicare. So they conclude workers are paying for Medicare benefits the same way they are paying for Social Security benefits. That isn’t remotely true, as new data from the Congressional Budget Office demonstrate. In 2010, payroll taxes covered a little more than a third of Medicare’s costs. Beneficiary premiums (and some other earmarked receipts) covered about a seventh. General revenues (which include borrowing) covered the remainder, slightly more than half of total Medicare costs. 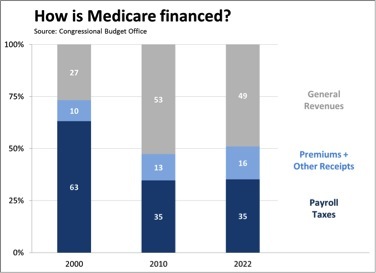 If you prefer to focus on just the government’s share of Medicare (i.e., after premiums and similar payments by or on behalf of beneficiaries), then payroll taxes covered about 40% of the program, and other revenues and borrowing covered about 60%. In contrast, payroll taxes and other earmarked taxes covered more than 93% of Social Security’s costs in 2010, and that was after many years of surpluses. The difference between the two programs exists because payroll taxes finance almost all of Social Security, but only one part of Medicare, the Part A program for hospital insurance. Parts B and D (doctors and prescription drugs) don’t get payroll revenues; instead, they are covered by premiums and general revenues. But that distinction often gets lost in public discussion of Medicare financing. As recently at 2000, general revenues covered only a quarter of Medicare’s costs. That share has increased because of the creation of the prescription drug benefit in 2003 and because population aging and rising health care costs have pushed Medicare spending up faster than worker wages. Over the next decade, CBO projects that premiums will cover a somewhat larger share of overall costs, while the general revenue share will slightly decline. Note: For simplicity, I have focused on the annual flow of taxes and benefits. The same insight applies if you want to think of Social Security and Medicare as programs in which workers pay payroll taxes to earn future benefits. That’s approximately true for workers as a whole in Social Security (but with notable differences across individuals and age cohorts and uncertainty about what the future will bring). But it’s not true at all for Medicare. 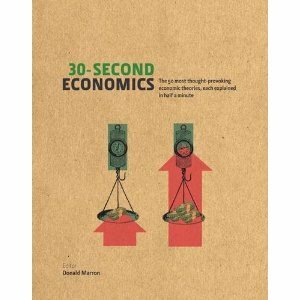 Rhetoric matters in economic policy debates. Would allowing people to purchase health insurance from the federal government be a public option, a government plan, or a public plan? Would investment accounts in Social Security be private accounts, personal accounts, or individual accounts? (See my post on the rule of three.) Are tax breaks really tax cuts or spending in disguise? Is the tax levied on the assets of the recently departed an estate tax or a death tax? Alan Krueger, Mr. Obama’s top economic adviser, offers a telling illustration of the changing views on income inequality. In the 1990s he preferred to call it “dispersion,” which stripped it of a negative connotation. America’s fiscal challenges are often portrayed as a conflict between hawks and doves. The real battle, however, is between foxes and hedgehogs. Unfortunately, fiscal hedgehogs still have the upper paw. “The fox knows many things, but the hedgehog knows one big thing,” wrote the ancient Greek poet Archilochus. Both foxes and hedgehogs play important roles in the policy ecosystem in normal times. In times of great change, however, society needs more foxes and fewer hedgehogs. More citizens and leaders who can adapt to new conditions, and fewer who want to preserve the status quo. That’s where we find ourselves today. Despite all the anguish over a debt limit deal, America’s fiscal outlook remains daunting. Little progress has been made on our largest budget challenges. Despite bipartisan efforts, prospects for a grand fiscal bargain remain dim. One reason is that fiscal hedgehogs still have the upper paw on key issues. Consider entitlements. Everyone knows that entitlement spending is our No. 1 long-term budget challenge. Because of an aging population and rising health-care costs, spending on Social Security and federal health programs will explode. The Congressional Budget Office estimates that over the next 25 years spending on these programs will rise from roughly 10 percent of the economy to almost 17 percent. Accommodating that growth would require substantial cuts in other government programs, much higher tax revenues, or unsustainable deficits and debt. The challenge is to find ways to keep the core benefits of these programs while reining in costs. This is where entitlement hedgehogs and foxes part company. The hedgehogs know one big thing: These programs provide major benefits. Social Security, for example, has dramatically reduced poverty among seniors and provides essential income to millions of retirees. Inspired by that one big thing, hedgehogs oppose any benefit reductions, such as increasing the eligibility age or trimming benefits to reflect increased longevity. Entitlement foxes have a more nuanced view. They recognize, like the hedgehogs, the value of the guaranteed retirement income that Social Security provides. But they also know that the number of retirees receiving benefits is growing faster than the number of workers paying payroll taxes. They know that Americans are living longer but retiring earlier. They know, in short, that the future will be different from the past and that the program needs to evolve to remain sustainable. Foxes are thus open to ideas like raising the eligibility age or changing the benefit formula. A similar dichotomy exists with taxes. Revenue hedgehogs know one big thing: Taxes place a burden on taxpayers and the economy. Thus, they oppose all tax increases, even efforts to reduce the many tax breaks that complicate our tax code. Revenue foxes see things differently. They recognize the burden that taxes place on taxpayers and the economy. But they also know that tax increases are not all created equal. Higher tax rates, for example, are usually worse for the economy than cutting back on tax breaks. Indeed, cutting tax breaks sometimes frees taxpayers to make decisions based on real economic considerations rather than taxes, thus strengthening the economy. That’s why revenue foxes support eliminating many tax breaks. Fiscal hedgehogs will never embrace such changes. To make progress, we need more fiscal foxes. Maintaining purchasing power in spending programs and indexing various parts of the tax code is an important policy goal. However, policymakers should ensure that the most accurate measure of inflation is being used. To correct the problem of over-indexation, many have proposed switching to the chained CPI [consumer price index] to provide a more accurate measure of inflation for indexed provisions in the federal budget. This switch was recommended by the National Commission on Fiscal Responsibility and Reform (“Fiscal Commission”) and the Bipartisan Policy Center ‘s Debt Reduction Task Force (“Domenici-Rivlin”). It has been incorporated into a large number of other plans, including from the Heritage Foundation on the right and the Center for American Progress on the left. An overwhelming majority of economists from both parties agree that the chained CPI is far more accurate measure of inflation than the CPI measurements currently in use. In addition to improving technical accuracy, switching to chained CPI would have the secondary benefit of reducing the deficit – by about $300 billion over the next decade alone. For the reasons they mention, I endorse this change and predict it will be part of any “grand bargain” on America’s budget. P.S. To my readers who believe that the regular CPI understates inflation, rather than overstating it: Yes, Aretha’s song is “Chain of Fools”. And yes, that makes it easy for you to make up lyrics that mock the chain CPI rather than endorse it. Have fun. Here’s a link to video of our panel; a bit more than an hour. The other day I discussed the Tax Policy Center’s distributional analysis of the Bowles-Simpson tax proposal. As you may recall, a key feature of the proposal we considered (“Option 1”) is that it eliminates almost all existing tax breaks and reduces tax rates on most types of income (but raises them on capital gains and dividends). One of the most dramatic elements of the tax reform plan offered by the chairs of President Obama’s deficit commission, Erskine Bowles and Alan Simpson, was their proposal to eliminate tax breaks for employer-sponsored health insurance, contributions to retirement plans, and other employee benefits. When the Tax Policy Center did its first analysis of that proposal on November 16, our modelers assumed (perfectly reasonably) that if these benefits were now subject to income tax, workers would have to pay Social Security and Medicare payroll taxes on them as well. Because these tax subsidies are so generous, a payroll tax on their value would generate a lot of money—more than $100 billion a year. And that extra levy would have a noticeable impact on the how taxes would be distributed among various earners under the plan. But after we published our analysis, the Bowles-Simpson staff told us they did not intend to hit workers with payroll tax on this income as well. So TPC has run a new distributional analysis for the Bowles-Simpson plan without those extra payroll taxes. It turns out that everyone still pays more tax on average, but less, of course, than if they were hit with bigger payroll taxes. The lowest 20 percent of earners (who will make an average of about $12,000 in 2015 and who pay far more in payroll tax than in income tax) would pay about $200 more than they do today, instead of an average of $400 if they took a payroll tax hit as well. Their typical after-tax income would be cut by 2 percent, instead of 3.4 percent if they had to pay that extra payroll tax. Middle-income earners (who’ll make about $60,000) will pay about $1,000 more instead of $1,900. Their after-tax income would be cut by about 2.2 percent instead of 4 percent. People at the top 0.1 percent of the economic food chain would also save about $1,000. But when you’re making an average of $9 million, and paying a half a million in new taxes, an additional thousand bucks is easily lost in the sofa cushions. You can also see the importance of the payroll tax effect in the debt reduction proposal released on Wednesday by a Bipartisan Policy Center task force on which I served. In that proposal, the rollback affects both payroll taxes and income taxes. The extra Social Security revenues from phasing out the tax exemption for employer-sponsored health insurance account for about one-third of the plan’s overall improvement in Social Security solvency. Bottom line: When you are cutting tax breaks, it’s a big deal whether you do that for payroll taxes as well as income taxes. It looks like 2011 will be another year without a cost-of-living adjustment (COLA) for Social Security recipients. Why? Because consumer prices haven’t yet returned to the peak they reached in the third quarter of 2008, when the 2009 COLA was set. Beneficiaries received a healthy 5.8% boost in their payments in 2009, which made sense after the sharp run-up in energy prices in 2008. But then energy prices collapsed. The inflation rate used to calculate the COLA was negative from 2008 to 2009. The cold logic of cost-of-living adjustments would thus have implied a reduction in Social Security benefits in 2010. For understandable reasons, however, Social Security doesn’t allow negative COLAs. So benefits remained flat, and 2010 went into the record books as the year without a COLA. The same thing will happen in 2011. Consumer prices have increased since the third quarter of 2009, but as of the August CPI report, they still fell far short of the peak reached back in 2008. Barring a miraculous surge in inflation in September, that means that 2011 will be the second year without a COLA. The Social Security Administration will make its official no-COLA announcement on October 15, just a few weeks before the mid-term elections. If last year is any guide, that announcement will set off a flurry of debate about whether Social Security recipients should receive a special benefit adjustment above that implied by the COLA formula (or, in this case, the unCOLA formula) and whether such special payments might be desirable as a form of economic stimulus. If you are interested in all the facts surrounding the COLA calculation, the incomparable Calculated Risk has a wonderfully detailed analysis.